Since 1989, Distant Lands has been serving the needs of travelers, whether they are bound for a trekking expedition to Tibet or a relaxing weekend in Santa Barbara. Started by Adrian Kalvinskas, Distant Lands grew out of his love for travel. From an early age, Adrian followed his mother Louanne on her adventures around the globe, from Morocco to Australia, and to many places in between. Drawing on these experiences, Adrian created Distant Lands–A Traveler’s Bookstore, to equip travelers with information and skills to make travel easier and more enjoyable. Since opening its doors, Distant Lands has quadrupled its inventory, but has not lost its focus. An atmosphere conducive to browsing and the love of travel are paramount, as is the depth and breadth of its selection. The aim at Distant Lands is to give the traveler the most complete selection of books and maps in an atmosphere that encourages wanderlust. 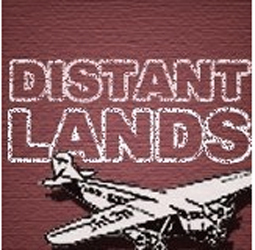 In 1995, Distant Lands Travel Outfitters opened, giving the traveling public access to the very best travel accessories, clothing, luggage and travel packs available. Durability, functionality and usefulness to travelers of all descriptions determine the items found at Distant Lands. The result is a one-stop resource center for the serious traveler. Today, Distant Lands Travel Bookstore and Outfitters strive to be the best source for travelers, with a knowledgeable staff, informative programs, selection and the willingness to go the extra mile.